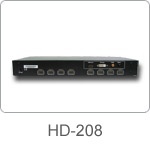 HD-208 is a two-input eight-output HDMI(DVI) Switch/Converter/ Splitter. The two inputs include DVI and HDMI. DVI input is accompanied by SPDIF audio. The SPDIF input has two forms. One is by RCA connector, another is optical connector. The user could choose either of them. The inputs could be selected by one button on the front panel. HD-208 could convert DVI with SPDIF audio into HDMI, and distribute to eight identical HDMI outputs. These eight outputs are synchronized. When HDMI input is chosen, it would be a pure 1 to 8 HDMI splitter. HD-208 has the ability of buffering and amplifying. Series connection of HD-208E achieves long distance transmission of HDMI signal of more than 15 meters. When two or more HD-208 are stacked together, they can be used to create a larger distribution (Daisy chained). HD-208 offers solutions for digital entertainment center, HDTV retail and show site, HDTV, STB, DVD and Projector factory, noise, space and security concerns, data center control, information distribution, conference room presentation, school and corporate training environments. • Distribution: Eight identical HDMI outputs. • Cascaded (Daisy chained): Large distribution achieved by stacking HD-208.